SyFy has tapped Canadian filmmaker Steven Kostanski to helm the next installment of the popular Leprechaun horror series. Kostanski is a member of the Astron-6 filmmaking collective who we've covered a lot over the years here as well as a writer/directors of last year's The Void. The new film is titles Leprechaun Returns and we've even got a short teaser below to wet your appetites. The film is written by Suzanne Keilly who has worked on Ash vs Evil Dead. 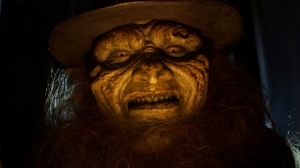 Leprechaun Returns finds the leprechaun revived in the modern day when a group of sorority girls unwittingly awaken him while tearing down a cabin to build a new sorority house. The new sequel is written by Suzanne Keilly (Ash vs Evil Dead) and directed by Steven Kostanski (The Void). The cast includes Taylor Spreitler (Kevin Can Wait) as Lila, Pepi Sonuga (Ash vs Evil Dead) as Katie, Sai Bennett (Lake Placid: Legacy) as Rose, and Linden Porco as the leprechaun (replacing longtime star Warwick Davis). Too bad. It would make a far more interesting film if the Leprechaun really did have to honor an honest coin-flip.